In Wordpress there is an option where you can choose what to display on your homepage - your blog posts, like everybody else, or a static page that works as a welcome page. In Blogger there is no such option, or is there? You will find out soon. Blogger is extremely customizable and a lot of Wordpress features can be replicated in Blogger with some clever coding. Today I will show you how to add a static start page to your Blogger blog that shows only when you visit the homepage. At first you might like to see a live demo. Since every blogger template is different, particularly the custom made ones, you will first have to understand the structure of the blogger template in order to know where to make the edits. At first backup your blogger template, which is a must before you do any sort of editing. 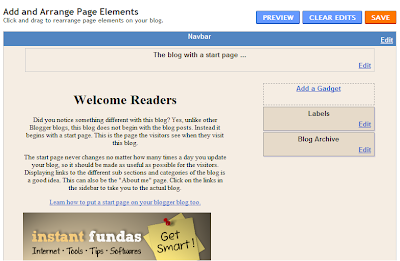 A typical layout of a blogger template, with one sidebar and a single footer is shown in the figure below. Some templates have an extra wrapper enclosing the main wrapper and the sidebar. Note, that almost all CSS based sites have this same basic layout. Press CTRL+F and search for "<b:widget id='Blog1'". The DIV section within which the widget Blog1 resides is the main wrapper. Once you have found the name of the main wrapper, find it's CSS description in the template. What we have done is added a new section called startpage which shows up only when you visit the blog homepage. The blog posts are removed from the home page. If you click on any post from the links on the sidebar or visit the labels and categories section, the startpage will disappear and your blog posts will show up. Now all you have to do is design your start page using any HTML editor like Frontpage and copy the code in place of <!-- Start Page Goes Here-->. It's possible to remove the sidebar, footer and even the header and make the start page take up whole of the screen. You just have to use the correct width parameters in the CSS and then place the sections you want to remove within the <b:else/> and </b:if> sections. Try it. It will make your blog unique. Thank you Sri Kaushik. This is for which I was waiting for a very long time. Hi, First of all thanks so much for your tutorial! I am pretty much a beginner so these changes are a bit challenging but I followed your instructions and it all looked pretty good except that my image does not appear (?!). (I uploaded the image (created in Adobe) in webs.com.) Any idea what can be the problem? Webs.com appears to have hotlinking disabled, which means the image wouldn't appear on anywhere else other than on sites hosted on webs.com. Kaushik, Thanks so much for your quick help but unfortunately some how I cannot figure it out. I did upload the image in photobucket instead but same problem a thin white strip on the page but no image....? Do I need to add some thing when copying my code instead of Start Page Goes Here? I've followed your tutorial and it's worked. Now, the only but is that now there are missing elements in the "page elements" page. For example I cannot see my sidebar, which makes it a little difficult to add/delete widgets. Is this normal or maybe I messed with something else? I think you messed up. The sidebar should show up unless you removed it from the homepage. Only the items removed from the homepage doesn't show in the Page Elements layout, in this case the - Blog post. I have added a new screenshot to the article it illustrate this. Yeah, my fault. I have just gone through the template and it turns out that I'd miswritten some of the stuff in the CSS... Sorry for the trouble... and thanks again for the trick! i failed to implement same on side bar? wow works very well but my "newer pages" link doesn't work anymore. it liks to the first page and not to previous. any solution? @tommibpusher: That shouldn't have happened. Something must have gone wrong when you were editing. I suggest you start over again. Can you help me out. Add Djraj10 on Skype to tell me the Basic Instruction cuz I ain't got it!!! I tried, but I couldn't. I am using a template "simple" and I haven't been able to find #content or main-wrapper. any help?? @IEP Rochelle: If you send me the template, maybe I can take a look. Could you please go into detail about how to remove the sidebar, footer, and header? I'm horrible at manipulating the html code. Never mind, I got it! Wow, it's amazing how being a dedicated blogger increases your knowledge of html. Great Article! I can't find the main-wrapper id you mentioned. The div containing the bwidget only has class attribute, no id. Is this still working nowadays? @Alex, don't worry if it doesn't have the outer wrapper. Just find the main wrapper, that is where the work needs to be done. What div you recon in the one that is the main wrapper? Thanks! 'column-center-inner' seems like the main wrapper. @The Internet Mosquito: If you don't know the basic CSS stuff, it will hard to proceed. Just create a new DIV section called start page and define your own styles and use that instead. to include the actual urls? Great tips! It's done. Thanks a bunch, Kaushik. its hard for me to do it my god! It has to be more simple than that I thought. And yes - it is! I edited my template using your tutorial. Everything is working fine if I use static text only. then Internet Explore block the prewiew mode with this message: "Internet Explorer has modified this page to help prevent cross-site scripting attack". @Moorfrosch: Whatever code you are trying to add is triggering the message. You should review the code because IE thinks it's dangerous, and maybe it is. I still have no idea, where is the problem with my code. I only used "p" and "h1" tags. Nothing special. What do you think why IE saying this scross-site scripting thing? If I make this change with firefox (no error messages while editing the code), than IE display my blog without any problem or scross-site scripting message. Kindly confirm if something has gone wrong while editing the template. @Maninder Singh: That looks like a Blogger problem, but also depends on what you were trying to do. Usually, errors in the template doesn't produce this error message. Thanks for the great tutorial! I have one question, though. I'd be glad if you found the time to answer this! Is it possible to just define a page already created in the blogger settings (say something like the photo gallery, one's resume, etc.) as the start page? What would I have to insert instead of "!-- Start Page Goes Here--" to link to this page? @toolpaddz: No, that won't be possible. You could use meta redirect to redirect the homepage to another page, but I won't suggest you to do that. hey. thanks for this.. im gonna use this on my blog.